Spider-Man has many offensive kicks that utilize his agility and webbing. With his swinging momentum and acrobatic jumps few can claim to be better than face kicks than webhead. A Bicycle kick to the face is also a go to move. Allows Spider-Man to stay in motion while delivering a powerful blow to someone's head. Spider-Man literally just jumps on someone's head. 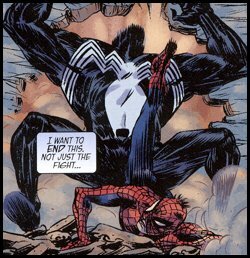 One of Spider-Man's most powerful moves is to slingshot himself then either do a kick or punch at high velocity. Here he catches the Green Goblin with one. Here Spider-Man uses his agility and flexibility to kick upward. This move has helped when he is in a seemingly precarious position on the ground. It has been used to save himself as a defensive move and also as a way to turn the tide of battle.